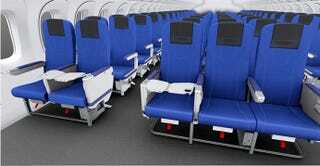 It’s a really good question: Why can’t airline seats be as comfortable, durable and adjustable as the ones in cars? In a partnership with All Nippon Airways, Toyota has come up with a new seat design it claims can make a “wide range of body sizes” comfortable. In economy, no less. By forcing us to sit so upright, airline seats force all of our weight onto our hips, giving us that hunched-over feeling. If seats can better support the pelvis, passengers don’t fatigue those muscles. So the adjusted height and length of the seat and backrest is all about distributing pressure throughout the seat, which allows you to have a more relaxed posture and enjoy the flight. Also notable are the rounded edges and softer materials you don’t feel crammed into a hard plastic jail.